The number of digits a numeric system uses is called its radix. The radix of a number is often displayed as a subscript at the end of the number. For example 101 base 2 (binary) is the same value as 5 base 10 (decimal). If you’ve never been exposed to non-decimal radix numbers before, this whole concept probably seems quite strange. However, for raw binary information, non-decimal numbers (especially hex) are much easier to work with, and they are universally used by programmers from the largest mainframe to the smallest microcomputer. 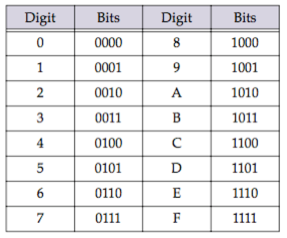 The table below shows the equivalent decimal, hex, octal and binary numbers from 0 to 32 (decimal). hex( -- converts a text item containing a hexadecimal number into a standard number (decimal). hexstr( -- converts a number to text formatted as a hexadecimal number. radix( -- converts a text item containing a number in a radix between 2 and 36 into a decimal number. radixstr( -- converts a number into a text item containing the equivalent number in a radix between 2 and 36.